Bangkok: Cricket's governing body has long dreamed of spreading the game to China, but the latest performance by its women's team is unlikely to inspire many in the world's most populous nation to take up the bat and ball. 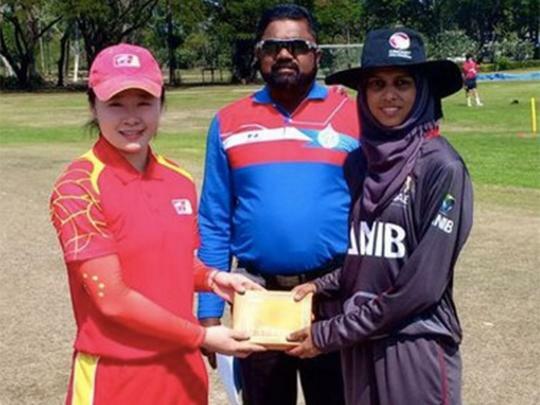 China were skittled out for just 14 runs at a tournament in Bangkok on Sunday - the lowest ever score in a Twenty20 international match, for men or women. In reply to the United Arab Emirates' massive 203 for 3, China were bowled out in under an hour and with 10 overs to spare at the Thailand T20 Smash. Hin Lili led their fleeting resistance to the UAE's unsparing attack, top-scoring with four. The Thailand T20 Smash includes fellow cricketing underdogs Malaysia, Indonesia and Myanmar. It is not the first embarrassment to befall Chinese cricket against Asian nations who Beijing dominates in economic and political terms, but struggles to match on the wicket. In October last year, China's men made a dismal 26 against Nepal at a World Twenty20 qualifier, a total bested in just 11 balls. China is a newcomer to world cricket, having fielded its first international team at the 2010 Asian Games. Its women's team is ranked 25th of 47 countries playing women's T20, according to the International Cricket Council website. China's men and women play mainly low-ranking T20 events against regional Asian sides, most of whom are also minnows on the global cricketing stage. The ICC has previously described China as a "strategic priority", and said it is working with the China Cricket Association on ways to "achieve sustainable growth in one of the most complex and competitive sports markets in the world".